Hello everyone, today I would like to review Hidden Figures, an Oscar-nominated movie. There’s been a lot buzz about the movie online and it’s only right you guys get firsthand information about the movie. The idea for this review came from one of the comments, a dear friend left. Prior to seeing her comment, I had no idea that my reviews made sense, lol. Anyway, here goes. I personally love to watch movies that had made a lot of buzz on the internet; just to see what the hype is all about, and I am happy to say that Hidden Figures did not disappoint me. 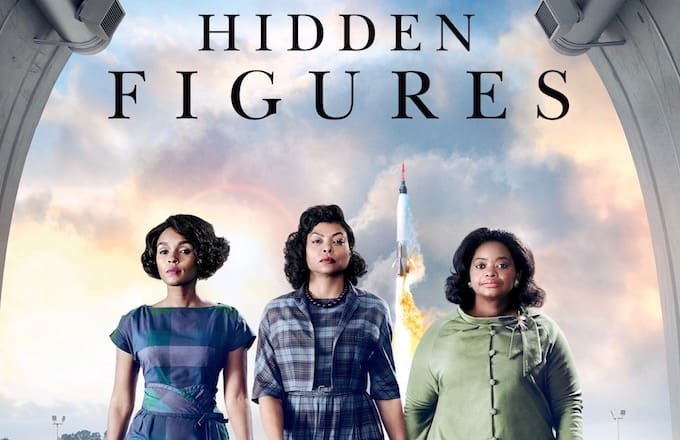 First off, this movie portrays the life of three (3) African American women and the contributions they made to aeronautics and space. Katherine G Johnson, Mary Jackson, and Dorothy Vaughn; three black friends who worked for NASA, in a group called the West Computing group. They were called computers as during that time, there were no machine computers until much later. They were responsible for calculations of space missions. The movie did a damn good job of honouring these women. I must applaud the producers of the movie for getting appropriate actors (Taraji acted as Katherine, Janelle Monae as Mary Jackson and Octavia Spencer as Dorothy) who did outstandingly well. In my opinion, Taraji deserves an Oscar for her role in this movie and my God, Janelle gave a surprisingly great performance. When I first heard Janelle was in the movie, I didn’t expect much from her, but she blew my mind away. Both Taraji and Janelle deserve the awards they got from their roles in this movie. I love this movie and I was telling my sister it is important that movies like this be made so black people can know where they are coming from. Black people really suffered honestly, especially as the era in which the movie was set, segregation was backed up by law. For crying out loud, why should I be treated differently due to the colour of my skin? From this movie, I discovered that during segregation, black people couldn’t use the library or even borrow books, they sat separately from white people, bought groceries from a different shop, it must have been really difficult growing up and living in such a wicked environment. While I was watching Hidden Figures, I kept asking myself where there really Christians during the segregation era? What type of Christian will openly and happily despise someone simply because you both do not share the same skin colour? And these guys must have been going to church and professing Christ, oh, honestly it beat my imagination. After all, Jesus said in the bible, there is “neither Jew nor Gentile”. But it’s unfortunate that even till today Racism still exist and I doubt if it will ever cease. My high point in this movie was the moment when Katherine confronted her colleagues. They treated her like dirt and wanted nothing to do with her. The thing is she was the first and only black woman working in the midst of all white male engineers. They didn’t want her to get coffee from the kettle they all used, so they provided a separate jug for her and tagged it coloured. They were coloured bathrooms, black people couldn’t use the white people’s bathroom neither could they eat in the same place. So the poor lady had to walk ten (10) blocks just to use the restroom. One day her supervisor was looking for her, he had taken note that every day she always disappeared from the office for over 40minutes. So on this particular day, when she appeared from her usual “disappearance act”, he asked her where she had been and she replied, the bathroom, going further to say, “There are no bathrooms for me here”. He asked for clarifications and she proceeded to let him know, she had to walk miles just to ease herself, and the reason she always has to go to the bathroom is because she wasn’t paid enough to eat well so she lived on coffee; a coffee pot none of her colleagues were willing to touch. How terrible it must have been to be a black person at that time. That scene is so emotional, I cried. Katherine’s confrontation marked a turning point in NASA as her supervisor broke down every coloured tag. Segregation was abolished in NASA from that period. This movie is mind-blowing; you get to see how 3 black women pushed the envelopes, broke through barriers and obstacles and made a difference for their race and their country. Katherine, for example, was an outstanding mathematician who at age 10 was already in high school. She was responsible for the calculations of space missions. Mary Jackson was the first black African American Aeronautic Engineer and Dorothy Vaughan was the first black supervisor at NASA. I would recommend this movie as a must watch especially if you are a woman. In this movie, you see women who refused to let racism, and the definition of society to limit them. In the movie, there was a man who wanted to marry Katherine and he made the mistake of insinuating that women were incapable of working at NASA or being a Computer. I love the reply she gave him; she told him that, “I work at NASA not because we wear skirts, but because we wear glasses”. I wear glasses and that sentence gives me pure joy, lol. I believe women should be confident, and should not let anyone put them down or tell them, you can’t do certain things simply because you are a woman. If there’s one thing I hate to hear is that sentence, “Because you are a woman”. My being a woman does not make me handicapped or less than a human being. Less I forget, I loved the costumes in the movie, the costume director deserves an applause. I loved the hair of the 50’s, such gorgeous luxurious natural hair. It’s all so beautiful. I have natural hair and sometimes I feel my hair doesn’t make sense, so seeing such gorgeous manes gave me hope, lol. 1. 1. It’s important that parents believe in the dreams and aspirations of their wards. Katherine Johnson’s parents had to move from where they stay to another location; because in the vicinity where there were, there were no public schools for black kids, and Katherine was a child with such a great future that they knew they couldn’t mess with. How beautiful the sacrifice of a parent. 2. 2. There is absolutely nothing you cannot achieve, as long as you put your heart into it. For example, Mary Jackson who wanted to be an engineer would have put a halt to her dreams because the school were the classes would be held was an all white school and blacks were not allowed. But she refused to let the status quo be and went to court to protest that law. She won the case, went to school and later became the first black female Aeronautic Engineer. The funniest thing was that her husband even tried every means to discourage her, though she later got his support. 3. 3. On the road to success, you will have to overcome a lot of challenges and people that would discourage you. You will have to overcome jealous people, envious people, poverty, and discouraging times. Success is sure; just make sure you don’t give up. 4. 4. It is never too late to find love. Katherine who was a widow remarried at the age of forty-one (41) to the present love of her life even after three (3) children. 5. 5. You may be making every effort to make an impact in the world and you may be getting discouraged because you may not be seeing results now but don’t give up. Do everything you can to make life a better place and one day your reward will come. The movie is rightly titled “Hidden Figures” because these women have been hidden, up until now. Now the world knows the contributions they made and they are been celebrated for it. Lastly, I was watching this movie I kept asking myself, what legacy would I leave behind? Will my life be so great that a movie would be made about me? I don’t know if you think of such things, but I believe it’s a question worth thinking about. I hope my life will someday make sense and I hope that my life would be inspiring enough to change people’s lives. If you have the opportunity, do yourself a great favour by seeing the movie. Thank you for reading, God bless you. If you loved this review, click HERE , HERE and HERE for other movies I have reviewed. Also, if you have seen the movie, kindly let me know what you think of the movie in the comment section. I watched the movie again this night after watching it previously, twice and I just keep loving it over and over again. I shed some tears at the point were sha confronted her boss. I really want to make an impact in my generation. God bless those 3 women for the role they played in the world. They really were hidden figures. I also cried at the point were she confronted her colleagues. My dear you & I share the same sentiments. I want to make an impact in my generation; that's my driving force now.